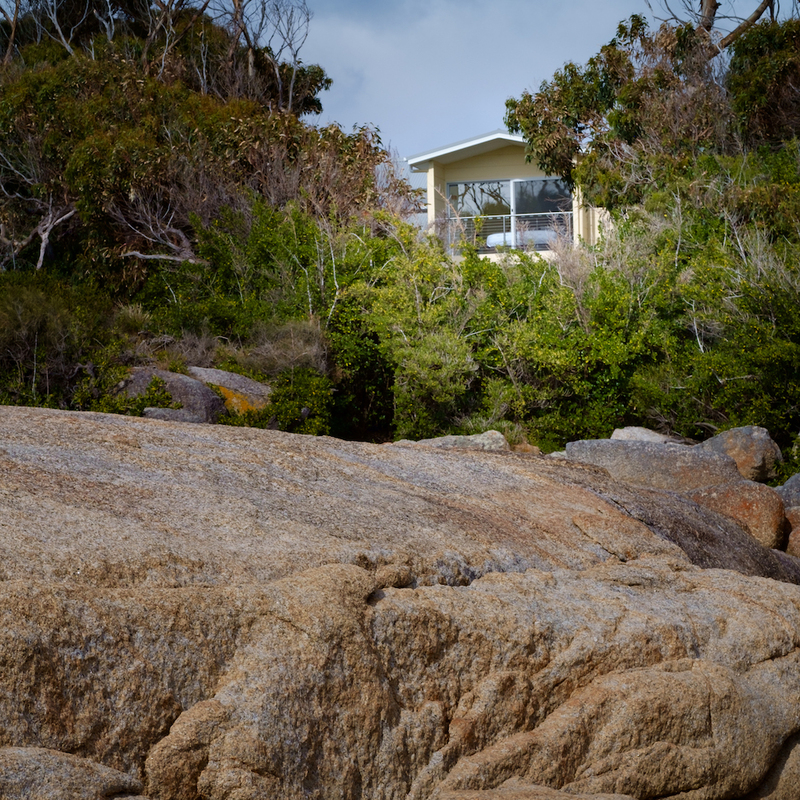 The Lookout is the heart of Cod Rock Point; comparable to the very best that Bicheno has to offer. Starting with it’s spectacular location, and generous use of glass. 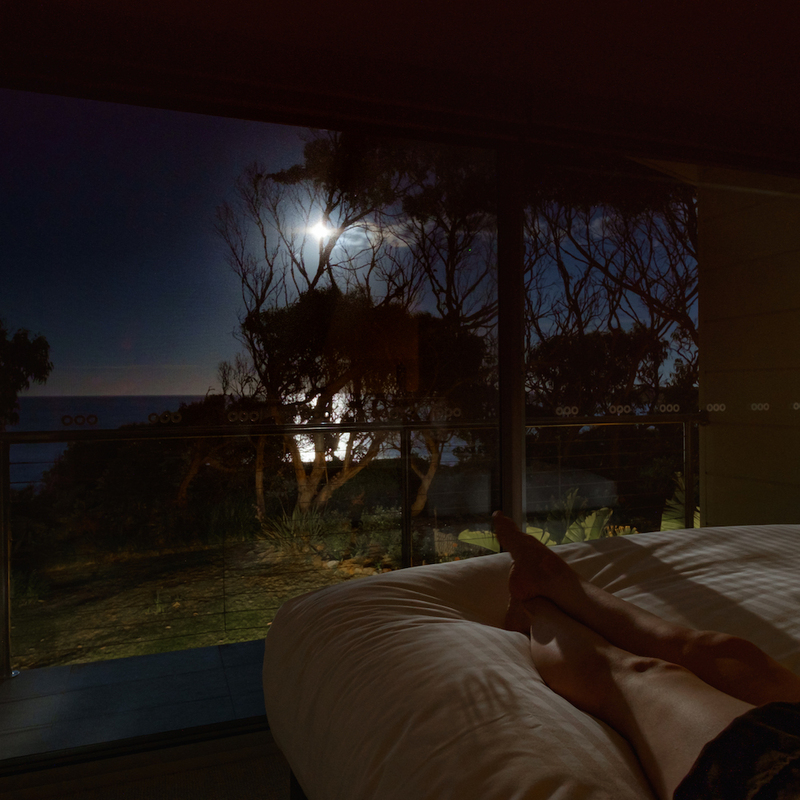 Just 20 paces from the ocean, you are close enough to listen to the waves, smell the salty air, and recharge in that wholesome, wholehearted way that only happens when you are by the sea. At the bottom of the garden you will find a beach track and a special rock seat we love to enjoy in the evenings with a glass of wine. 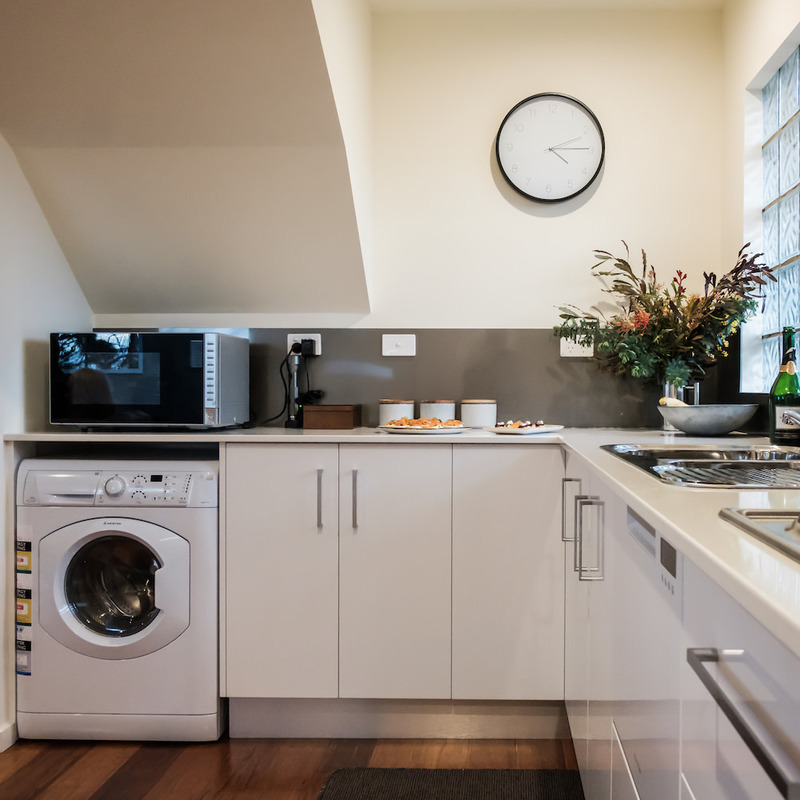 Downstairs, the kitchen is thoughtfully equipped with everything you might need to create a culinary triumph, and includes a dishwasher to make life easier afterwards. You can dine inside, or make the most of the BBQ and alfresco dining on the discreetly designed patio. Original artwork tastefully reflects the signature colours of Tasmania’s East Coast. 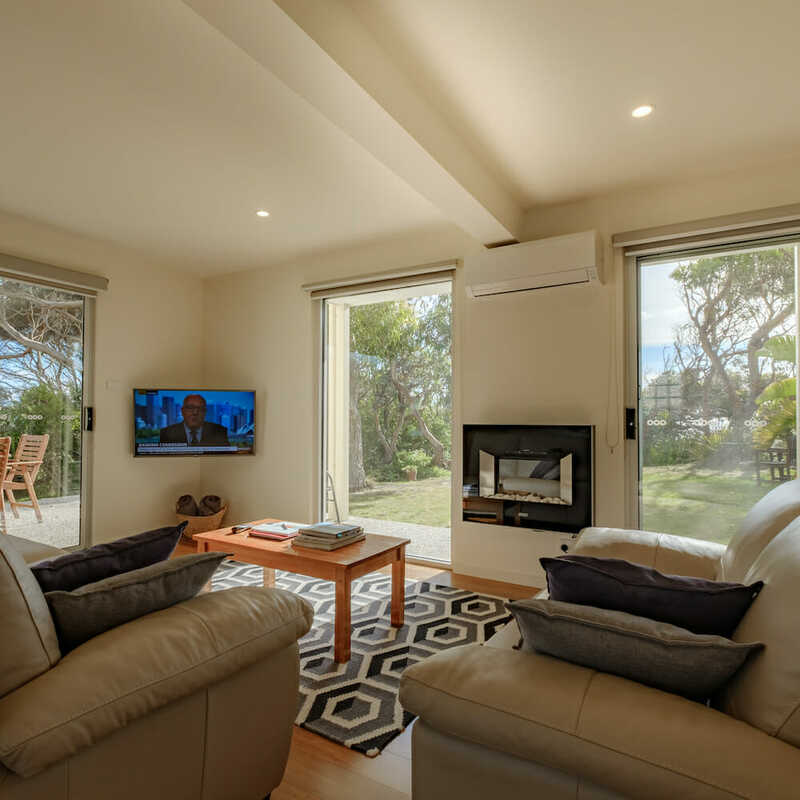 A smart TV connected to NBN, Wi Fi, and Bluetooth sound system ensure that you have all the modern comforts of home. Relax on the leather lounge and make the most of the floor to ceiling windows, which gaze out into the enchanting garden and its pathway to the water. 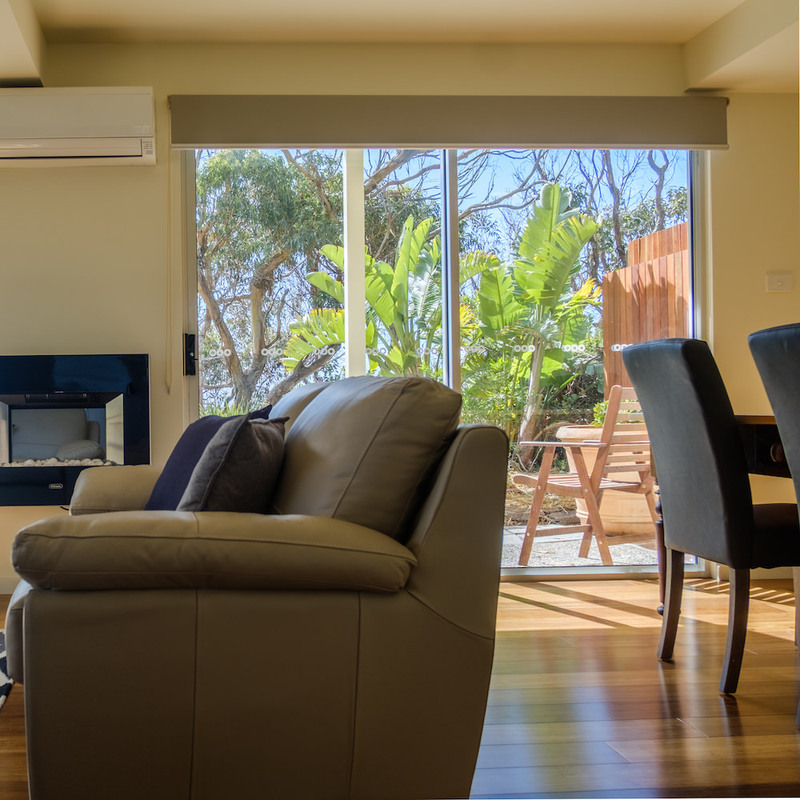 The smart heater and air conditioning system in the lounge ensures this is a great place to stay, all year round. 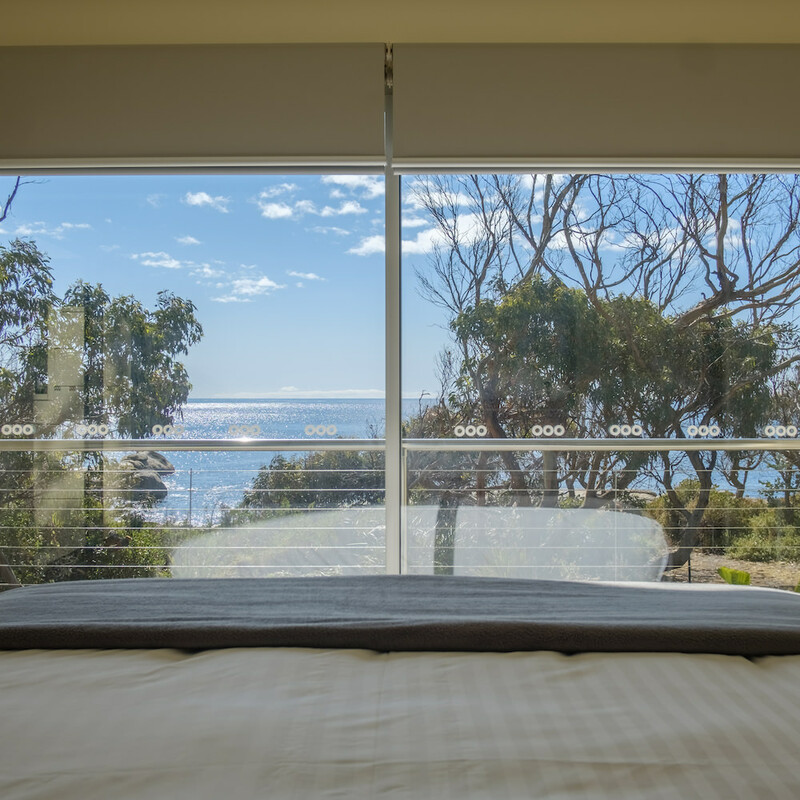 Upstairs, the king sized bed looks straight out over the ocean. 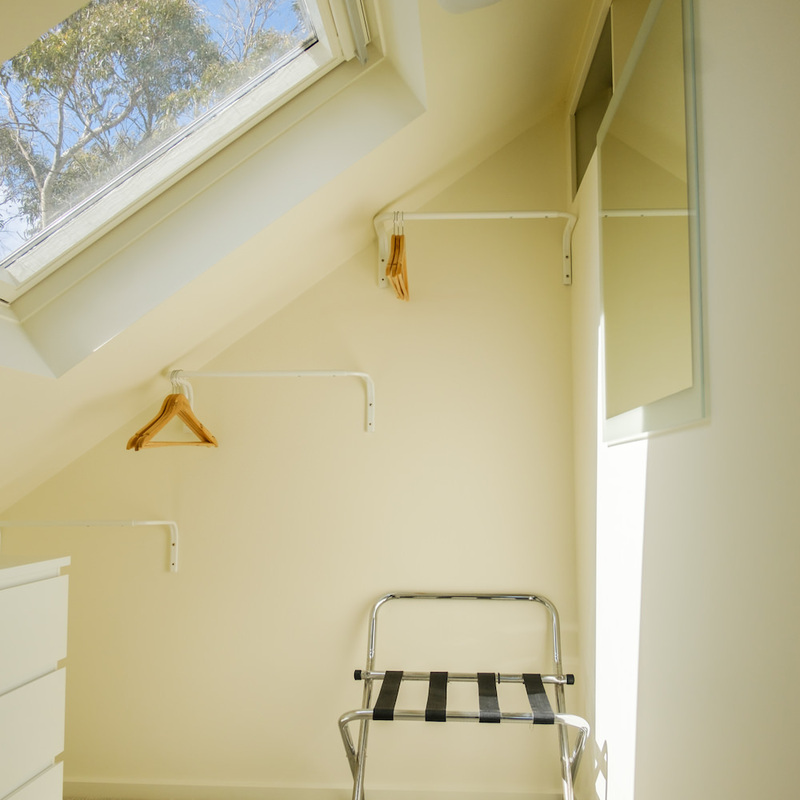 A separate dressing room, en suite and reading / relaxing area provides a generous feeling of space, opening to 2 upstairs balconies – one of which offers complete privacy for that “all over” tan. Of course, there is private off street parking. 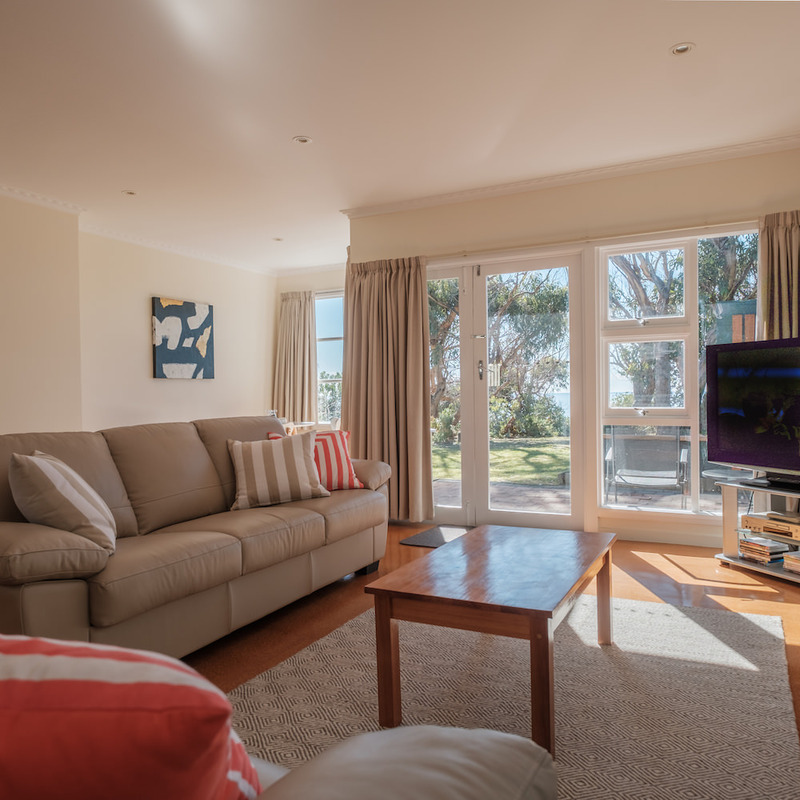 It is easy to leave your car parked with Redbill Beach just a quick 5 minute stroll to the left, and the shops off the right, 12 minutes walk at the most! The Nook at Cod Rock Point could not be more perfectly named. 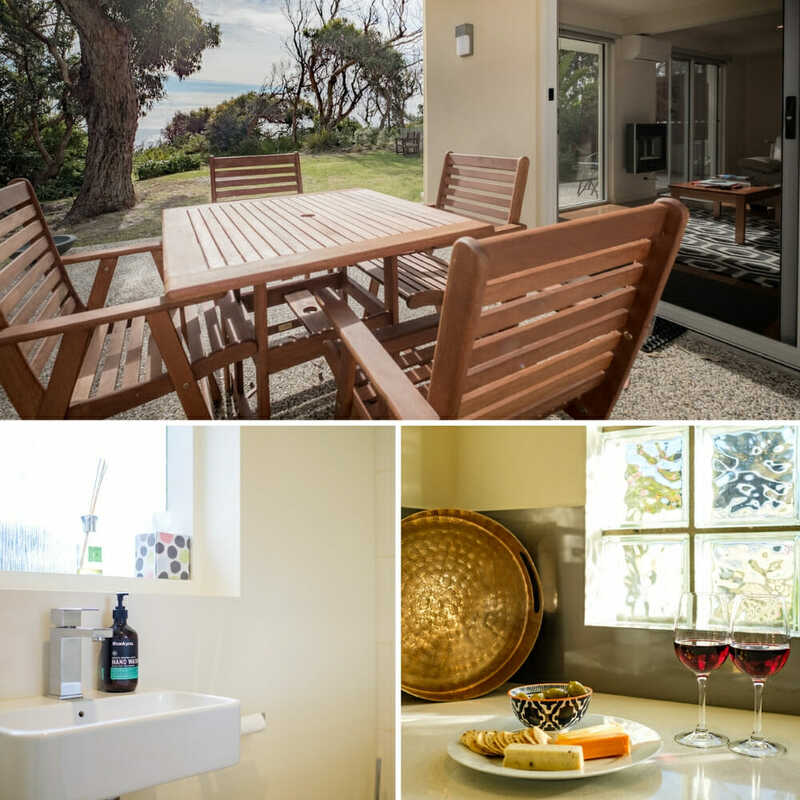 Ideal for a couple looking for a private retreat, The Nook is an exceptionally delightful hideaway, cosy, and comfortable with all the conveniences of home, and the spoils of a holiday. 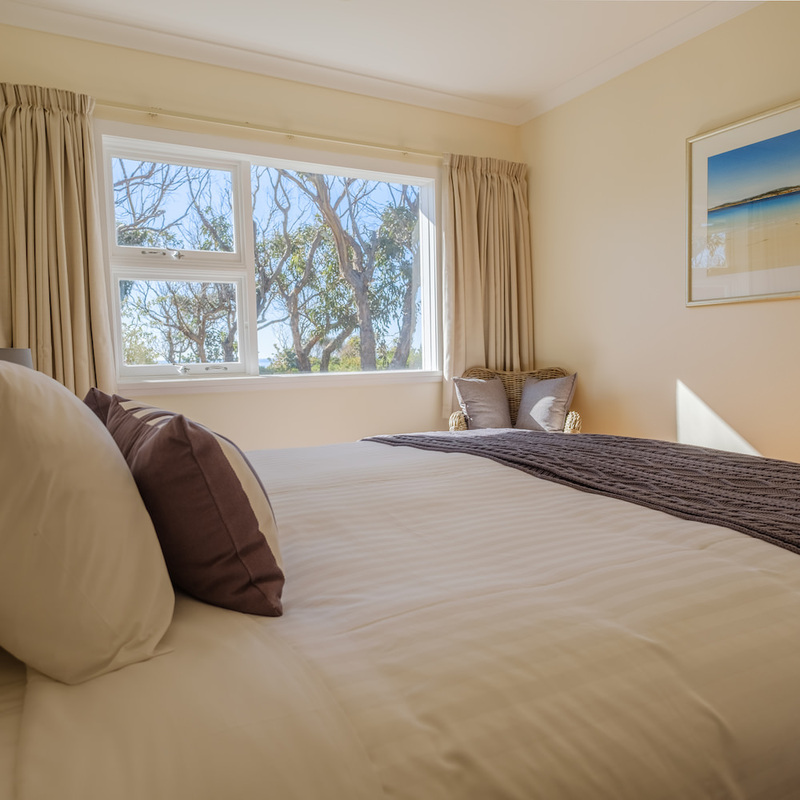 The bedroom is light and comfortable, with a recently renovated ensuite, king size bed and a dreamy view into the carefully landscaped garden, specifically designed to attract local birdlife and promote privacy, it is so private in fact, that our resident Little Penguins often wander through it and around the back of The Nook to their nests. 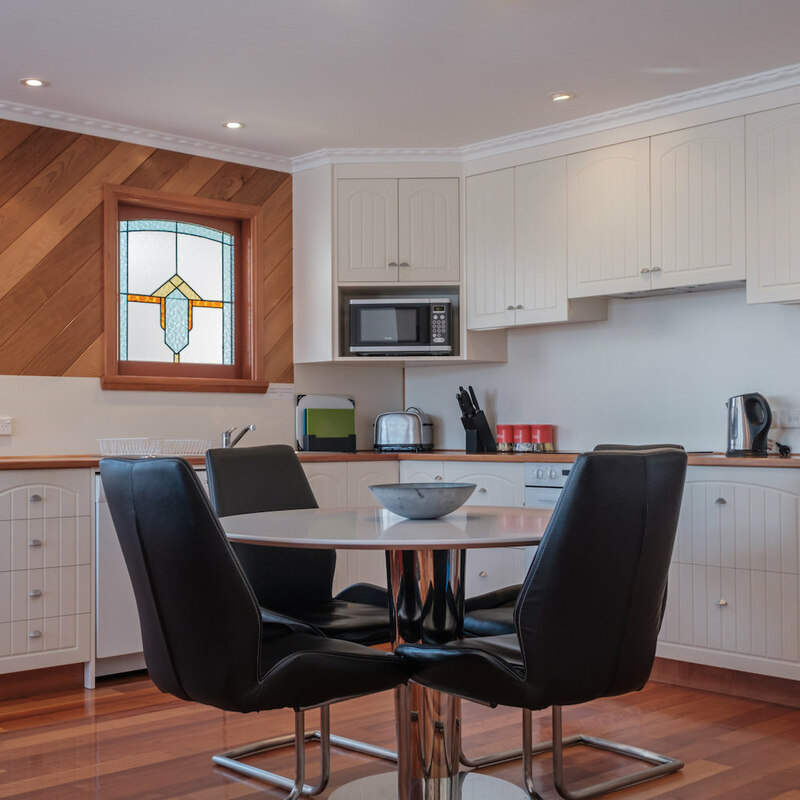 The kitchen is fresh and fully equipped which makes self-catering a breeze. The lounge is luxurious leather; artwork is tasteful, and relaxing. 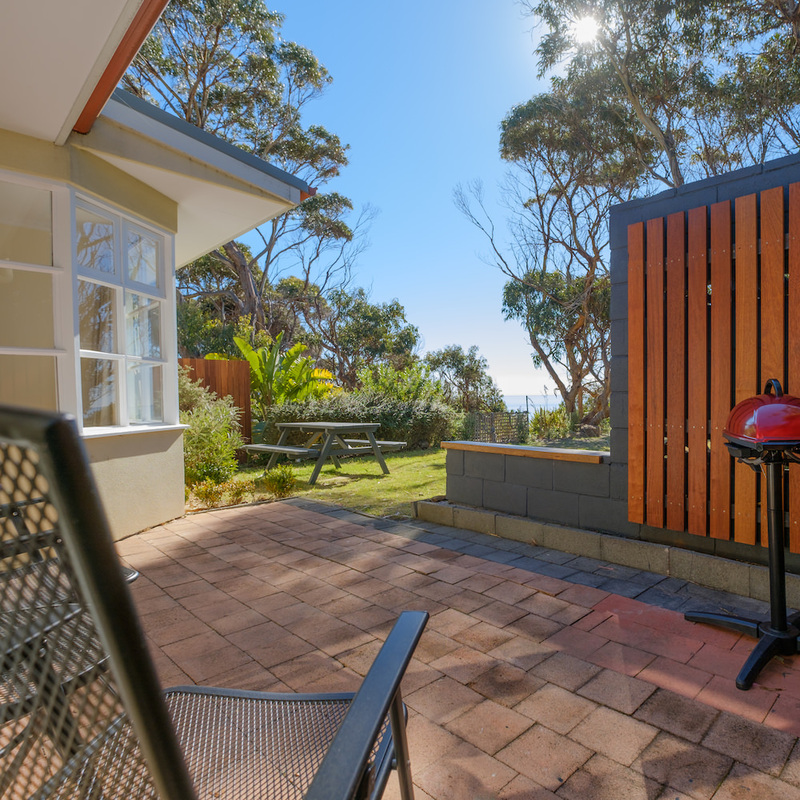 Also on hand for your convenience is a gorgeous dining nook, free Wi-Fi, Bluetooth sound system and a sheltered courtyard for alfresco dining, enjoying a view of the sea though the garden. 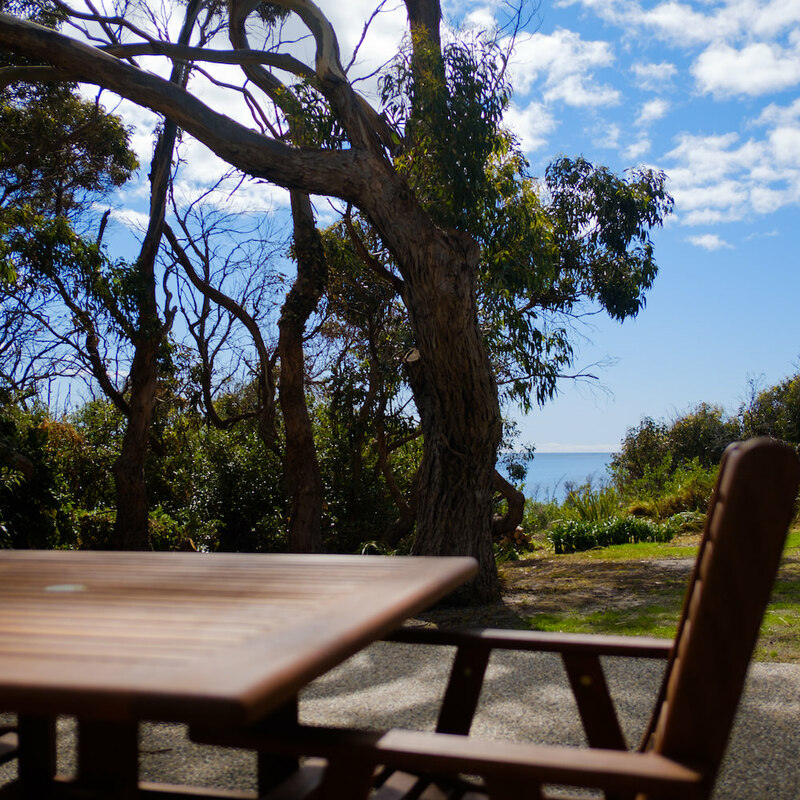 Your garden leads to the beach track, there is special rock seat down there for a glass of wine in the evenings. Redbill beach is less than 5 minutes walk to the left. To the right are the shops and Waubs Bay Beach, Surf Lifesaving Club which is a 12 minute walk at most. 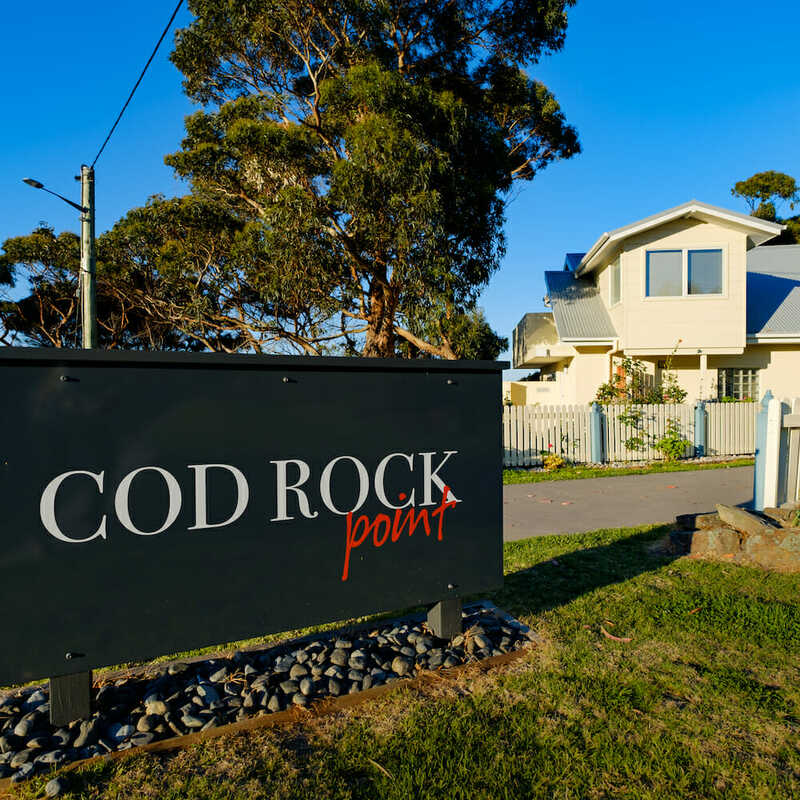 The House at Cod Rock Point is less “holiday house”, more modern, spacious home. 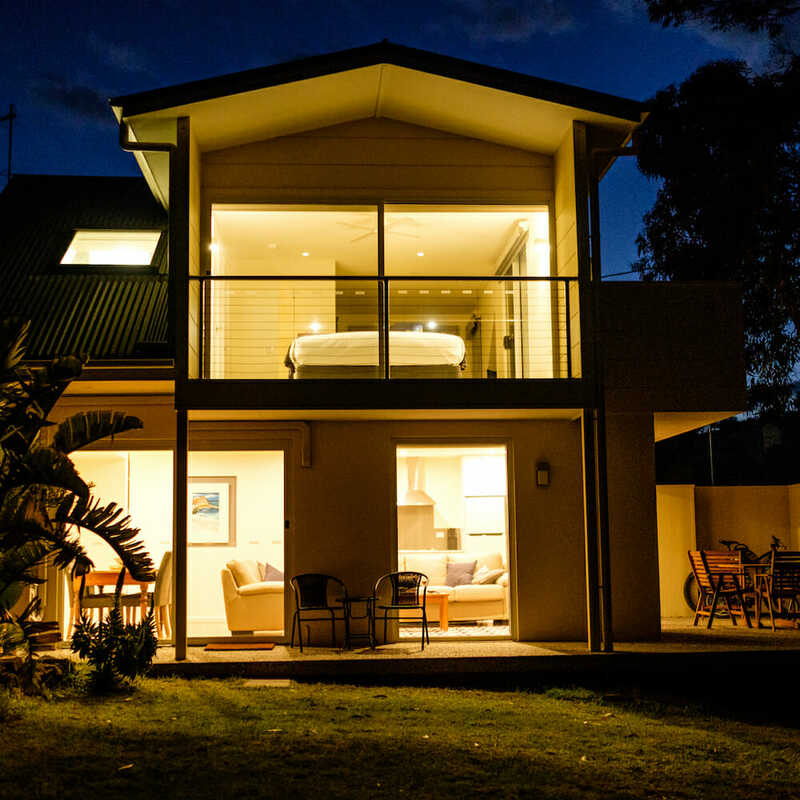 It is airy and spacious, perfect for either 2 couples or a family of 4. 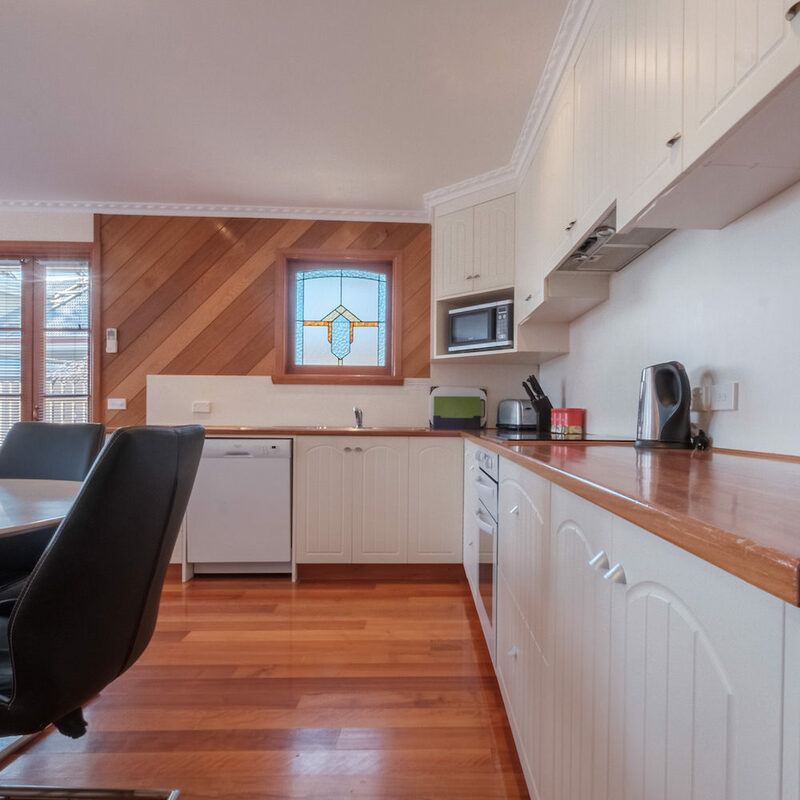 The dining and living areas are open plan and welcoming, and the kitchen is fully equipped with everything you could possibly need for either a quick visit or an extended stay. 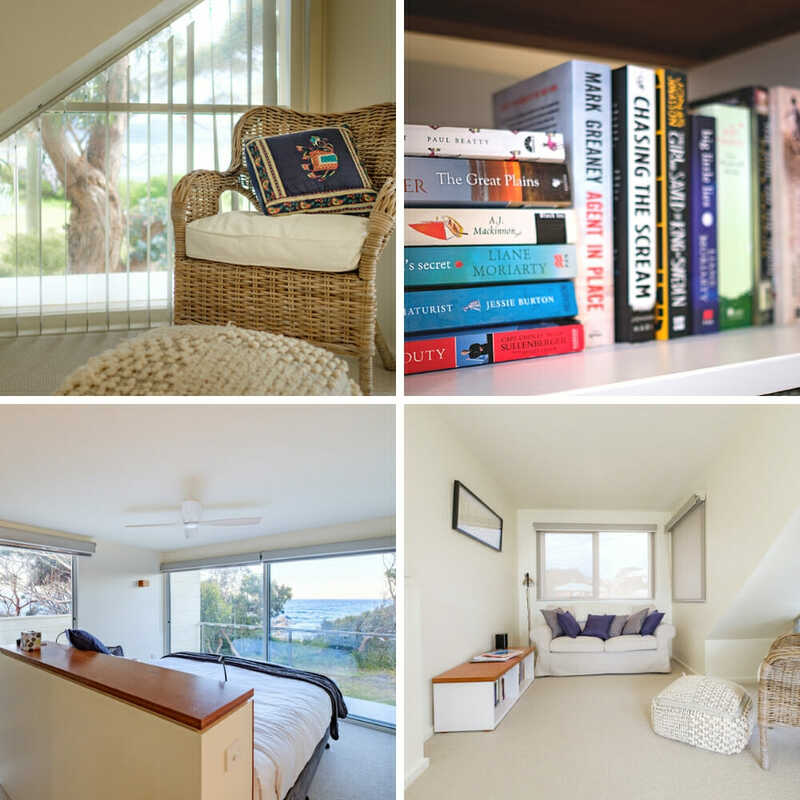 The master bedroom, upstairs, is generously appointed with king size bed, private bathroom complete with bath, a lounge and cosy reading space. 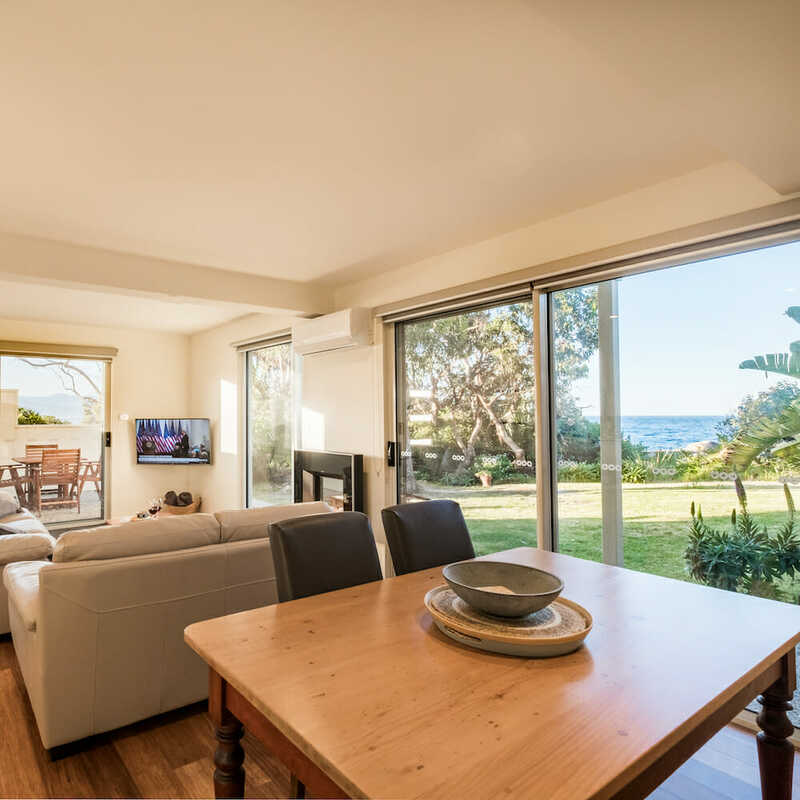 It also boasts a large out door patio with delightful views out to the ocean and across to Diamond Island; the perfect location for enjoying some leisurely afternoon sun, or perhaps some pre-dinner drinks. 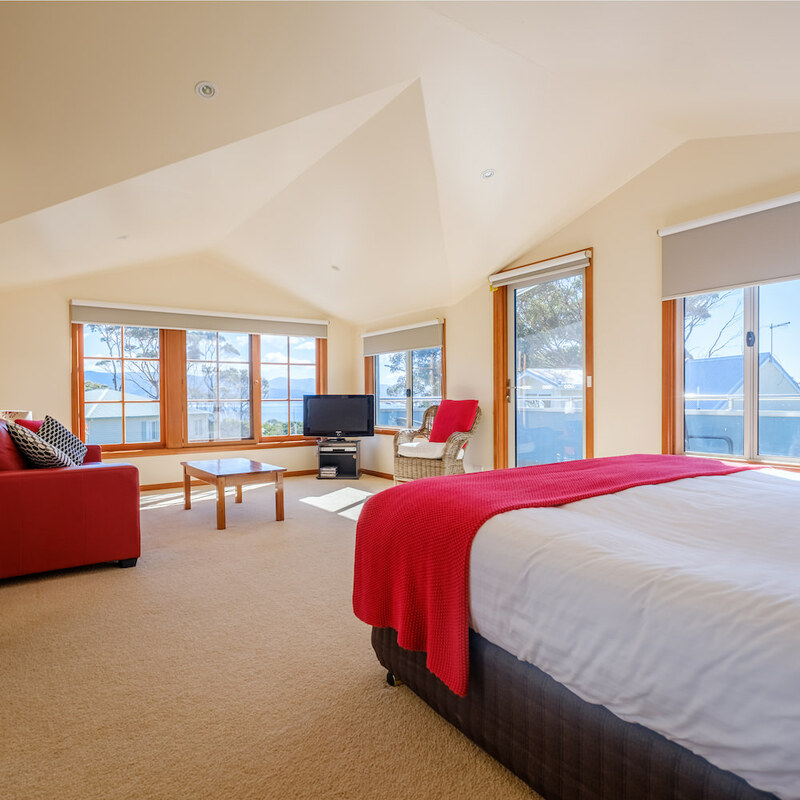 The second bedroom also has a king size bed, but it can be split into singles to suit a family. 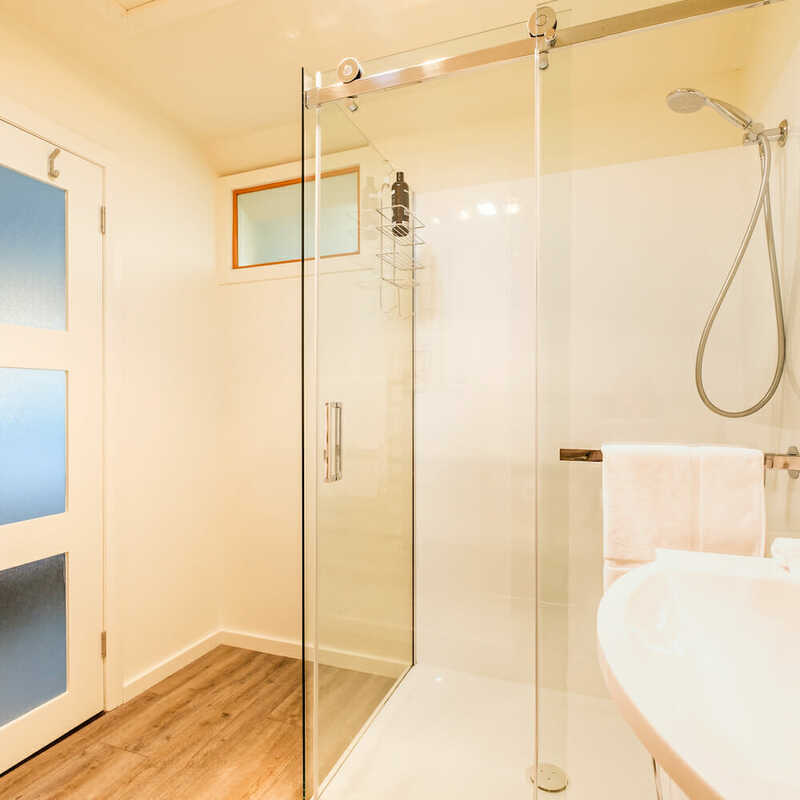 Also roomy, it is situated on the ground floor, adjacent to the second bathroom and living spaces. 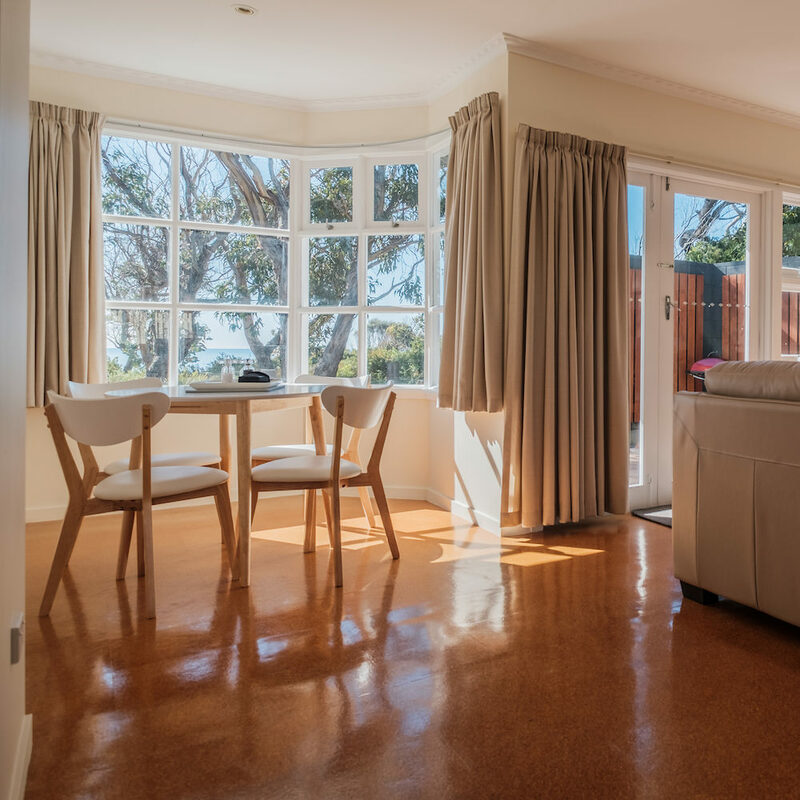 Conveniently located with just a 5-minute walk to Redbill Beach, and 12 minutes to the shops, The House is ideally situated. 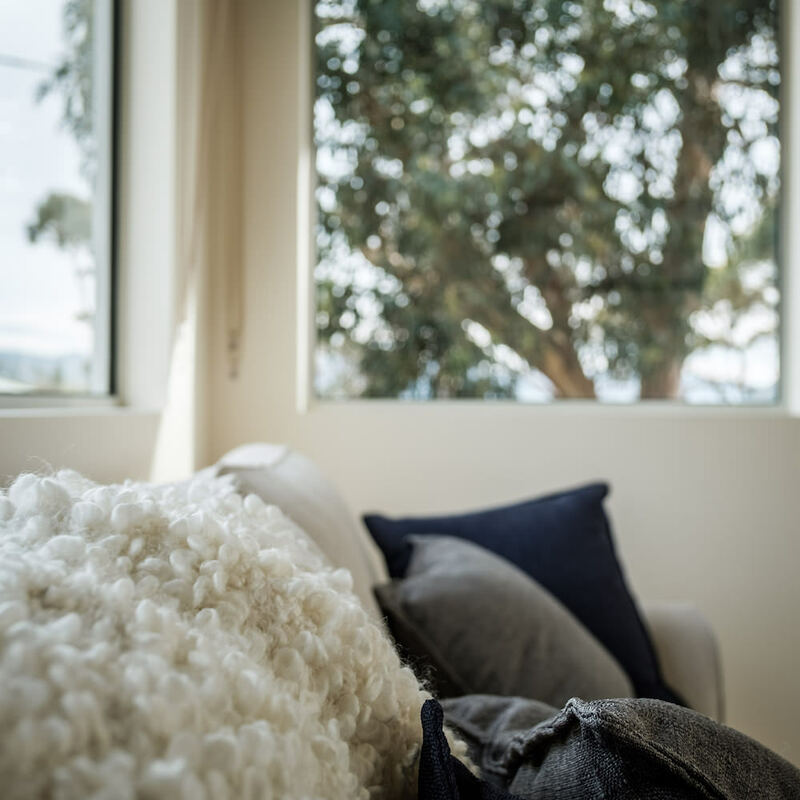 Additional features include an outdoor dining area, free Wi-Fi, off street parking for 2 vehicles and all of the standard furnishing and appliances you would expect to find in a home.